In Chinese, they're called "nail houses" (钉子楼 or "ding zi lou"). 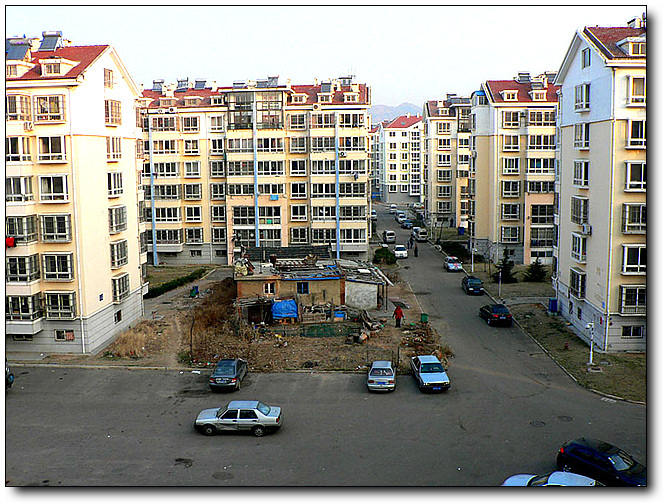 These protest abodes stick up for as long as the owner—and ultimately, the Chinese government—allows them to. Then, they're smashed down. 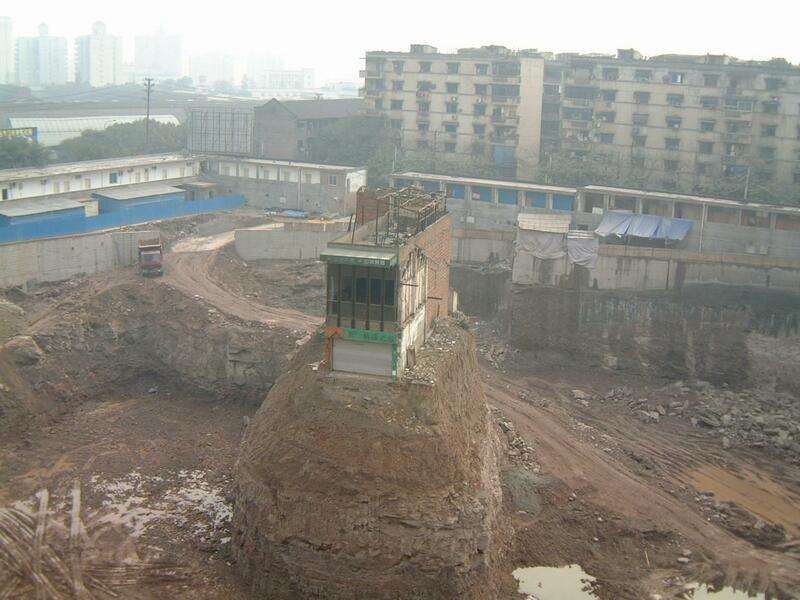 Recently, Chinese site XinhuaNet ran photos of a nail house in Rui'An, Zhejiang Province. The entire building, save for one corner, has been torn down. Zheng Meiju, the apartment's owner, is refusing to vacate, alleging that the compensation the construction company offered is not sufficient. This past January, the water was shut off. In February, the electricity was turned off. Since then, she's been carrying buckets of water from the village to use for the restroom, cooking, cleaning, and drinking. "Now the weather is really hot so I head over to a friend's house to cool down," said Zheng. "I come back to sleep at night." 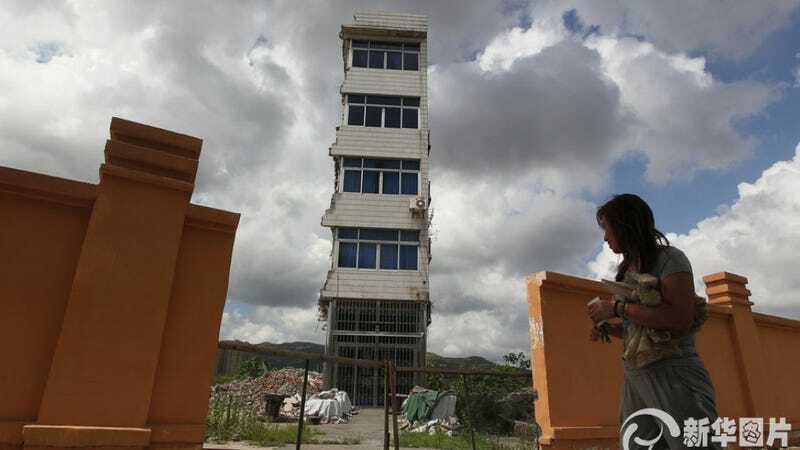 Zheng is not an area local and thus has different resident status, which is why she says the construction company offered more money to the Rui'An locals. Compounding the problem is that it's necessary to pour in extra money to fix up the housing that was offered to her, she says. Zheng also claims that she's having financial difficulties and is therefore stuck in this apartment building until she gets a better offer. Nail houses are not exclusively motivated by money. Often, there is a variety of factors at play. Moreover, nail houses are not strictly Chinese. There are countless examples abroad. The Pixar film Up, for example, featured a nail house. Now, thanks to the internet, a slightly more daring media, and new real estate laws, these protest houses get more exposure in China. And the construction companies (and their government backings) are forced to put up with them longer so as not to look too oppressive, with some residents refusing to leave for years. Allowing them to continue is, in a way, good PR. Here's a look back at some of China's nail houses from over the years.